Note: I received an ARC copy of this book in exchange for my honest review. In no way did this affect my opinion. 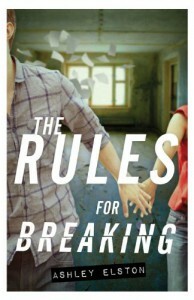 The Rules for Breaking by Ashley Elston was a thrilling follow up to The Rules for Disappearing. It contained many twists and turns, making the plot fairly unpredictable. It was also extremely different from The Rules for Disappearing. In this book, Anna and Ethan find themselves pitted against Thomas and a mysterious man that oddly seems familiar to Anna. This time around Anna doesn’t know who to trust, including law enforcement, and there may be more than one person that wants her dead. I enjoyed this installment for its plot. It was a bit of a slow start, but so many secrets were uncovered that kept things interesting. I also thought the identity of the masked, mysterious man with Thomas was an interesting plot twist and explained a lot regarding why Anna survived in the first place back in The Rules for Disappearing. Anna and Ethan did get on my nerves a bit. They kept going in circles, relating the same mistakes. I love how they continued to stick together though. They always seemed to talk things through. So although I was a bit annoyed, I continued to adore them together. I love how Ethan kept trying to stick by Anna regardless of whether or not he was physically capable. All-in-all, I loved and enjoyed reading The Rules for Breaking. I was definitely anxious to know Thomas’s intention after The Rules for Disappearing, and Ashley Elston certainly delivered answering all of my questions. 4.5 stars overall for Ashley Elston’s The Rules for Breaking.